Some weeks ago I was standing in my kitchen and looking at some date-paste my fiancé was given as a present for Christmas together with some other delicious things. Come the nuts and oats in a chopper, which can grind it to a flour-like consistency. Pour the ‘flour’ into a bowl. Add the date-paste and mix it all together to a soft dough. Use a teaspoon to take the right amount of dough up from the bowl and form it into a ball. Make all the balls and place them on a plate. On another plate you’ll pour out cocoa powder and roll the balls in it until they’re fully covered. 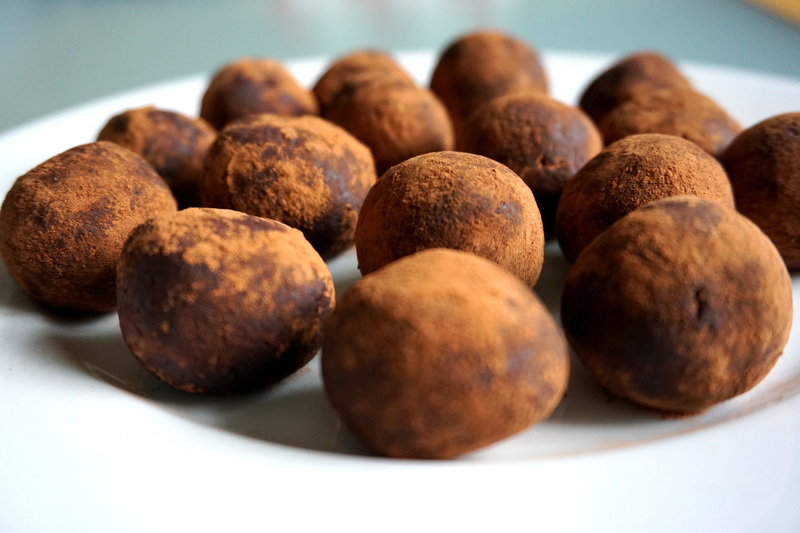 Set the balls aside or put them into the fridge to soak up the cocoa powder. Keep them in the fridge and eat them within 5 days. Please comment if you try to make these.